Ella is picky about her wardrobe these days! If you notice, she is wearing a purple flower in her hair...she picks this one out every time. She picked out her shirt as well. I was trying to get her to wear tights like the "ballerinas" do and so we had to go to the computer and show her how ballerinas wear tights (it was too cool to go without them even in the house I felt) Anyway, we showed her and she fell in love with the tutus that the ballerina were wearing. She has had one in the past, but it was pretty worn so I had to throw it away. No ordinary skirt would do...we "had" to have a tutu! So what does her grandma whip up?! We finally got to use the sleds for the first time, that the boys got for Christmas! Wasn't quite the KC snow we used to get, but that is ok...we all had such a blast. We have several great hills we can sled off of and at the bottom of one, we built a campfire to "cozy" up to while sledding. You will have to excuse me...I am sporting a "no makeup" look. No LL Bean for us...Luke has the trusty "Carharts" on! This girl is "all girl". Having two older brothers...you would think that she would play with cars, little men, or something "boyish". But not Miss Ella. She picked out this dress to wear, these glasses, this bow, had to have on her butterfly ring. I am loving every minute of spending time with my health little girl! Whew...what a time we have had last month (December). 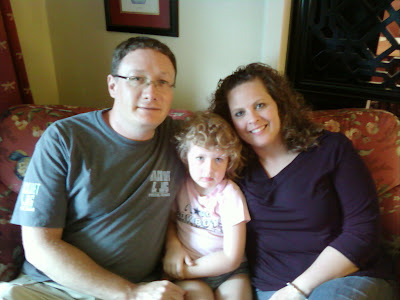 We had one good day after Luke's illness, when Ella began the same symptoms. Hers lasted a little longer...an entire week. She would "writhe" in intense pain along with vomiting due to the pain. It was so horrible. Unlike Luke, she would eat and drink some, but she had diarrhea where he did not. We called MD and figured it was Mesenteric Adenitis...same as Luke. Her urine becomes pink, then slightly yellow so we think she is getting better. Then on Monday after Christmas, she begans to throw up again. The next day again. So Shawn and I decide we have to bring her in...enough is enough! Two weeks of sickness. So I take her in and the MD decides to do blood tests. Just what we wanted. She is stuck 6 times and finally we get the blood as well as urine test. That afternoon, the MD calls, she is anemic too much. Her kidney ratios are off some. He calls Children's Hospital, talks to docs. They say bring her in that night. So off we go. They admit...and stick her a couple of more times with IVs. Her H & H is so low now, that she is having a heart murmur, heart rate increase, and increase in BP. They decide she must have a blood transfusion. So about 5 am, we get to the room and they transfuse. For several days, they try to decide what is going on. Her blood cells are being destroyed...what is the cause. They rule out kidney issues. Although apparently with the amount of blood in her urine, she narrowly escaped acute kidney failure. They do more tests and decide that she has hemolytic anemia. They still don't know the cause. They know it isn't autoimmune. They think she might have a genetic blood disorder in which the cells become misshapen in an event of stress...hers being the viral bowel infection. She was discharged last night. Her hemoglobin is still low, but reasonable. We will recheck on Friday. Then follow up with Hematologist in two months (now that she has someone else's blood circulating, they are unable to do more blood test to determine etiology for several months). Shawn was there the whole time. He had taken off...we were to leave for Texas the morning after she was admitted. Who would have thought we would be there twice. Our children are healthy. They have not been very sick other than the general colds and virus here and there. This time I was not alone in my experience. Shawn saw and felt the same intensity of Children's that I did when I was there a couple of weeks prior. He has been humbled by the experience like I was. Today we have sat around and marveled at our children. Sat around and taken in the blessing of health and healing. Today on 2011 we count our blessings. Two visits in one month. We are home...she is better...I am exhausted. Just browsing thru old photos. This one is of ella summer 09. How time flies. Well I had that experience this week. He gets better the next day...long story short mesenteric adenitis... a virus in the colon that cause your lymph nodes inside the large intestine to inflame and swell causing intense pain. Who knew?! He gets better and better, we are discharged. It has taken me two days not to get teary eyed throughout the day. You see, Children's Hospital has only children as patients...while this may seem obvious, it didn't really "set in" until I experienced it. Yes, I am a nurse and worked with "peds", but have not worked in a hospital where it was entirely kids. And back then, I was not a mother, I worked with the perspective of a nurse, not a mom with a sick one. It was so heartbreaking. Luke went to play (the day he was feeling better) at Camp Wanna Play. It is a play area set up for the kids. They made Rudolf cookies and got to decorate them, paint, play Wii or XBox, color,...all kinds of fun stuff. In there, we were surrounded by such precious ones that were sick. No hair, hair just growing back, ones like Luke that were just there short term, ones that had no parent there at that time and some that did. All of us had IV poles that the volunteers helped to navigate around to each area. While Luke played the XBOx, I couldn't help but just weep,so grateful Luke was doing better and pain was leaving and for seeing little ones riding in wagons with 4 or 5 IVs coming from their bodies. A group was the singing Christmas carols for the kids, State Police came around and gave out teddy bears. I knew Luke was going to be ok, going to get to go home. However, I greived so badly for the others, the little ones that didn't get to walk out to their car in the sunshine the day we left. The little ones that did not feel like coming to "Camp Wanna Play". We are home now, but my mind is still there. FINALLY...after a year, we have a computer with internet at home. Sooooo, I would like to think I will start blogging again...which i have missed so much. There have been so many times that I have thought "I should post that"...but the logistics were difficult. So material for this blog should not be lacking in this stage of my life. Nope, not with miss Ella Bella around! Shawn and I was fortunate to be in the "Promise Land" this past week (for those of you who don't know what I am talking about...I am talking about Texas). We caught up with Rob and Shavon. We had such a good time. Shavon and I did not stop talking long enough to take a breath! We laughed about our fun times together, ski trips, exercising, Chilly Willy, JBU...we had the best time. I wanted to post their pic for all you JBU friends out there. We need a reunion soon. The cutie pie in the middle is their baby girl Isabella. She is four years old and has a sweet personality, not to mention adorable. Here are some more beach pics...I like this one of Ella in her bikini...which her dad does not approve of...notice how happy Jett is to have his picture take "again". Destin is usually has very clear water...but a week out of every year usually around June, they have green week. This is when the moss comes in...it hit the week we were there. It was kind of gross, but much better than oil. So as a result, make beach pics are not as nice as last years. Attention: This Blog is not dead! I read this headline on a friend's blog not long ago and felt it would be appropriate to add it to mine. You see I LOVE BLOGGING...I miss it terribly and now that I am at home more you would think I would update more. However, my computer is dead or near dead at home. However, my blog is not. And when I work on Tuesday, into the evening, I like to sneak a post in...in between billing...so don't think I'm not working "boss"...I'm blogging on my ten minute break, you see! So I thought I might share a pic or two! Miss Ella Bella eating seafood! She loved the sand...and so much easier this year now she can walk...instead of having to crawl on the beach like last year! Here are the kiddos...I actually can not believe I got them to all look at the camra at the same time...now if I could get them all to smile at the same time! So I suppose next time I should post some of the actual beach LOL! But today it fits really well. I just returned from Ozarka, where I put in my notice. I am giving up my teaching job. I loved this job...absoutely love the job. I never dreaded work. I loved teaching my "kids" about the human body, how to care for it, how to care for others. I loved opening their eyes about the elderly, trying to get them to break down sterotypes and see beyond the outside. I loved giving them oppurtunities to learn about all the many types of healthcare there is and encouraging them to persue a higher education. I loved hearing their stories and being around the energy of teenagers. I loved praying for them, silently, and their struggles. I loved praying over their chairs where they sit before or after class. I love their "quirks", their smiles, thier moods...everything. One day, I feel like I will do this again. Maybe once Ella starts school, I can teach a course or two for adults or even maybe this one will open back up. I know I have done the right thing, and it feels good. Bittersweet...that is my word for today! They are giving away a scholarship. The criteria...3.0 and a hunting license. I think I must of laughed a little too hard. One of my students tried to lock me out of my classroom. Also, I was notified by a friend, that one of the local restaurants offers Fried Bologna as a breakfast menu item. Also, yesterday while in Sunday School, we were talking and a friend reported that she decided to do some yard work yesterday, but was interrupted when her mom came out of the house to tell her that someone just called and said her "thong" was showing from her top side of her sweats...I mean really...we are in a small town, but who has time to report such "news"? She decided that the water dept girls across the street must have seen it, called a hundred people, until one brave soul called to report it. COmputer still down at home, so hence the wide gap in posts. Oh, another thing. I was called a "nerd" from one of my students because I said I would blog about the scholarship. No, I don't normally let my students abuse my verbally, but I was in rare form today. It has been a while since I posted pictures of the little ones so here are some, along with an update on each child! Jett is in 3rd grade and let me tell you, it is a lot harder than second grade! He has 5 teachers which makes it complicated. He is doing well though...is reading like crazy these days...and loves basketball. He just finished Upward basketball and is now playing on a traveling team. Dad is his coach! He is now hunting with Shawn for the first time ever and loves it. They haven't shot anything yet...apparently they are holding out for the "big one"! Luke is in Kindergarten. He liked it for the first week, but now would rather stay home! He is doing really well...teacher mentioned he could just about go ahead to the first grade! He just finished playing Upward Basketball as well. He is my quiet one...will find him upstairs drawing and playing without a peep for hours! That is unless he and his brother get in a fight! Miss Ella Bella is so sweet! She is totally spoiled...come on, we are still living with grandparents here! She has each brother, dad, grandpa, wrapped around her finger. She is sooo active. Doesn't stay still for anything! She loves being outside and gets really excited when she sees cows! Lately, we have noticed some really "girly" things about her...she doesn't like bugs...even play bugs and pretend spiders...she refuses to touch them, loves carrying around a baby doll, and has such a great time with necklaces around her neck. So there you have it, an update on the Fletcher Clan. Shawn in doing well...back to adjusting although somewhat modified! Feeling great! Then, Tuesday at 4 am, he burst into the bedroom and reports that he just about passed out and needed to go to the ER. No one was home (in laws were gone) so he "rode it out" for a couple more hours. Luke in the mean time, was running about 102 temp, so we decided that both of them would go in and get looked at. He had to be in the hospital for several days before they could operate due to pancreatitis. Finally after not eating for 5 days, the pacreatic enzymes decreased and they did surgery Thurs. evening laproscopically (thank goodness). he was discharged on Friday! 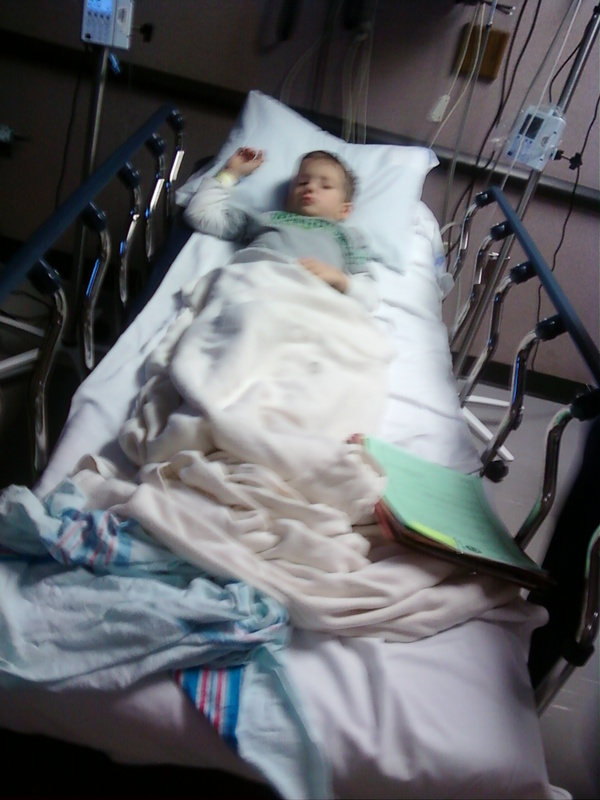 So needless to say he is sore, but recovering. The surgeon mentioned in could be a month before he could adjust...we are going to have to get creative here...we see him (the surgeon) tomorrow to "brainstorm" since a month is such a long time. I'm mother of three, married to my best friend, moved a couple of years ago to the "middle of nowhere" in the Ozark Mountains to open a Chiropractic Clinic. I serve an awesome Reedemer and love open mouth baby kisses, front porch swinging, dancing when no one is looking, baby wearing, watching my boys get dirty, the smell of fresh rain, sweet tea, Texas...period, sappy "girl movies", the RAZORBACKS, anything chocolate, and enjoying the journey of it all! Do I Need A Bigger Plate?